IRE1a relates to the UPR which is affected by Salubrinal. IRE1α dissociates with BiP and inhibits ER stress-mediated apoptosis in cartilage development. "Bone morphogenetic protein 2 is known to activate unfolded protein response signaling molecules, including XBP1S, BiP and IRE1α. Endoplasmic Reticulum stress is induced in chondrogenesis and activates IRE1α signal pathway, which is associated with ER stress-mediated apoptosis. IRE1α interacts with BiP in unstressed cells and dissociates from BiP in the course of cartilage development. Induction of ER stress-responsive proteins (XBP1S, IRE1α, BiP) was also observed in differentiating cells. IRE1α inhibition ER stress- mediated apoptosis lies in the process of chondrocyte differentiation. Knockdown of IRE1α expression by way of the RNAi approach accelerates ER stress-mediated apoptosis in chondrocyte differentiation induced by BMP2, as revealed by enhanced expression of cleaved caspase3, CHOP and p-JNK1; and this IRE1α inhibition effect on ER stress-mediated apoptosis is required for BiP in chondrogenesis. Collectively, the ER stress sensors were activated during apoptosis in cartilage development, suggesting that selective activation of ER stress signaling was sufficient for induction of apoptosis. Activation of p-JNK1, caspase3 and CHOP were detected in developing chondrocytes and that specific ER stress signaling leads to naturally occurring apoptosis during cartilage development." "The UPR includes three molecular branches (inositol requiring enzyme 1, IRE1; PKR-like ER resistant kinase, PERK and activating transcription factor 6, ATF6), which trigger both cell protective and cell death responses. If the cells are exposed to prolonged or strong ER stress, the cells are destroyed by apoptosis." "IRE1 is involved in the switch between the pro-survival UPR and initiation of cell death pathways during ER Stress. Attenuation of IRE1 can switch the adaptive UPR to apoptosis, and persistent activation of IRE1 increases cell viability upon ER stress"<-So IRE1 may help ER stress have good anabolic effects rather than bad catabolic effects. "sustained IRE1α RNase activation caused rapid decay of select microRNAs which repressed translation of caspase-2 mRNA, and thus sharply elevated protein levels of this initiator protease of the mitochondrial apoptotic pathway." "BMP2 activates UPR transducers, such as PERK, OASIS, and ATF6. BMP2 stimulated ATF6 transcription by enhancing the direct binding of RUNX2 to the OSE2 (osteoblast-specific cis-acting element 2) motif of the ATF6 promoter region." "BMP2 induces mild ER stress during chondrocyte differentiation and activates the IRE1α-XBP1 pathway, then XBP1S in turn enhances chondrocyte hypertrophy through functions as a cofactor of RUNX2. XBP1S controlled growth plate chondrocyte hypertrophy and differentiation. 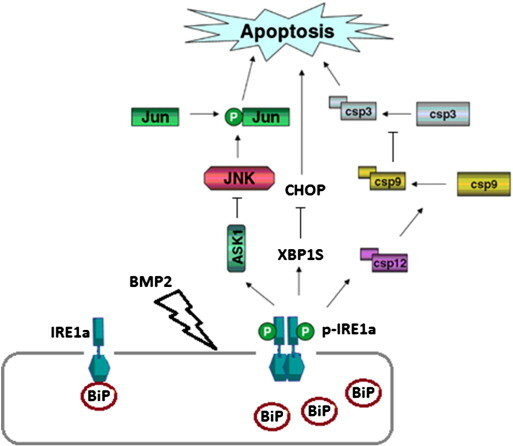 Besides, XBP1S can induce the growth and inhibits ER stress-mediated apoptosis via Erk1/2 signal activation and CHOP attenuation in ER stress"
" IRE1α [is in the] intracellular localization in the growth plate chondrocytes of developing cartilage "
"overexpression IRE1α can improve the BMP2-induced IRE1α"
IRE1a can help you grow taller during development by preventing chondrocyte apoptosis.